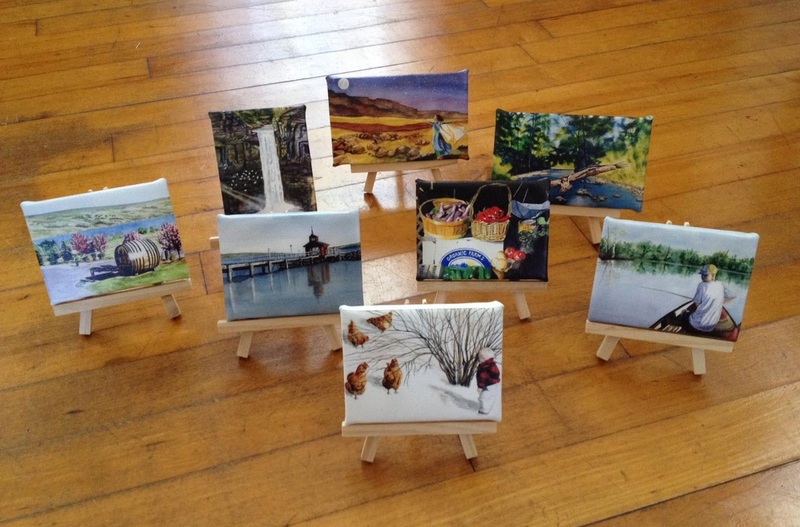 Each Miniature Giclee Comes With An Easel In A Gift Box! Give a loved one a special keepsake as well as a piece of fine art to display. These adorable, miniature giclees feature Laura Petrisin's original paintings and are sure to please! The scenes are created from the artist's personal experience and interaction with nature. Made with quality canvas and archival inks, each print is hand assembled and signed by the artist. Sizes are 3x3" or 3x4." A 4 3/8 black or unfinished, wooden easel is included with each print for display. Unique and perfect gifts for any occasion: Christmas, Valentine's Day, Mother's Day, a birthday, or simply to show you care. This artwork beautifully accents any shelf, desk, table, dresser, or vanity, and can be handed down for generations to come. 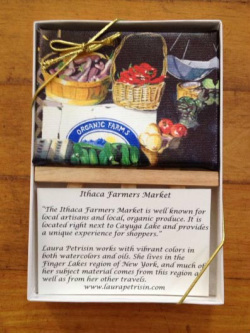 The art is packaged in an attractive, sturdy, white gift box with foam pad. The box is secured with an elastic, gold tie. A personal note is included describing what inspired the painting and where the artist is from. Tastefully packaged, the gift is good to go as is! Price: Original - $29.95. Items shipped first class or priority. *Return policy: Return within 7 days for any reason. I want you to be happy with your purchase. I offer a full refund if you are not satisfied, however return shipping costs remain the responsibility of the buyer. Giclee print of an original watercolor painting of Mennonite Girls Walking uphill in Penn Yan, New York.